Allium (al-lee-um), Chives, Ornamental Onion, ramps, spring onion, ramson, wild leek, wood leek, and wild garlic; Lily Family,are often known as "the onions", although the edible onion is only one of many species in this genus, some of which bear strikingly handsome flowers. Native to many parts of the Northern Hemisphere; they are almost all hardy perennials. Tolerates soil of any fertility and clay soil. These selections have not been known to reseed and is not invasive. It may be propagated in fall by digging it up and dividing the rhizome with the bulblets attached. 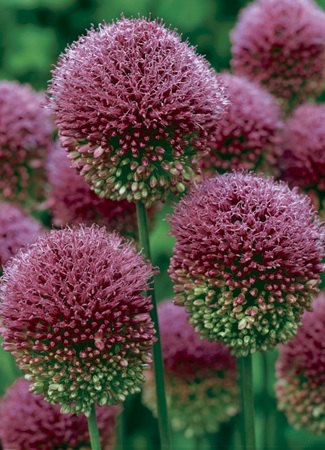 Allium is typically pest and disease free. Attributes: Border plants, Container, Cut flower or foliage, Drought Tolerant, Fragrant flowers or foliage, Mass Planting, Easy to grow. Attracts butterflies and honeybees. Deer and Rabbit resistant. Cannot ship to Georgia, Idaho, Nevada or Washington.